Analysis: Smith and Jalen Ramsey are the only two members of the team absent for the start of the offseason program. The 28-year-old is signed through 2021 and has $30 million remaining on the contract after signing an extension in late 2017, so it's unlikely to be any sort of holdout situation. Smith figures to report by June 11 for the start of mandatory minicamp. Analysis: Smith was a consistent producer, as he totaled less than six tackles only once and was in double-digits in six games. The 27-year-old has now led the Jaguars in tackles each of the last three years and has eclipsed 100 combined tackles in all five of his professional seasons. The 2014 fifth-round pick is signed with Jacksonville through 2021 and should be a solid IDP option once again next season. Analysis: Smith cut the Dolphins' fourth quarter comeback attempt (and playoff hopes) dreadfully short, intercepting quarterback Ryan Tannehill's 33-yard pass attempt for a pick six. The fifth-round linebacker has proven to be a solid IDP play all season, and is on track to close out the year strong. Analysis: Smith posted double-digit tackles for the third straight game, but the Jaguars defense was eviscerated on the ground by Derrick Henry, allowing 238 yards on 17 carries. The 27-year-old has a good matchup against the Redskins in Week 15, as the team should be run-heavy with Mark Sanchez likely the starter at quarterback. 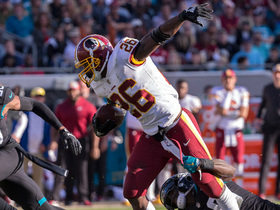 Analysis: Smith forced the fumble midway through the second quarter, which helped lead to one of the Jaguars' two field goals, which was their only scoring of the afternoon. 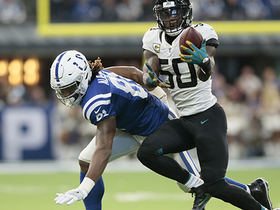 Jacksonville's defense took up its 2017 form Sunday with three sacks and two takeaways, as the 27-year-old continues to lead the group with 101 tackles (75 solo) through 12 games. Another divisional matchup against the Titans awaits Thursday. Analysis: Smith has a team-leading 88 tackles through 11 games this season, putting him well on his way to 100 tackles for the fifth straight season. He'll look to continue his strong play in Week 13 when the Jaguars take on the Colts. Smith had eight tackles (six solo) and recorded his first interception of the season in Sunday's loss to the Colts. Analysis: Smith continues to pace the defense in tackles, and Sunday's interception was really the lone standout play for the Jaguars, as they registered only three tackles for a loss and no sacks Sunday. Things won't get any easier in Week 11 as the Steelers come to town fresh off a 52-point explosion against the Panthers. Smith (shoulder) is active Sunday against the Colts. Analysis: Smith just saw the practice field on a limited basis this week, but the Jags leading tackler and elite IDP option will be healthy enough to suit up for the Week 10 divisional matchup. Smith (shoulder) is listed as questionable for Sunday's game against the Colts, Michael DiRocco of ESPN.com reports. Analysis: Smith was added to the injury report as a limited participant Thursday and was limited at Friday's practice as well. The fact the 27-year-old was still able to practice makes him seem on track to play Sunday, and the Jaguars can ill afford to be without their leading tackler in this vital divisional matchup. Smith (shoulder) was a limited participant in Thursday's practice. Analysis: Smith was not listed on Jacksonville's injury report to begin the week, so it appears that he may have suffered the shoulder injury during practice. Until more information about Smith's availability is disclosed, he should be considered questionable for Sunday's game against the Colts. If Smith were to miss any time, Blair Brown would be expected to slot into the starting lineup. Smith had eight tackles (six solo) and a fumble recovery in Sunday's loss to the Eagles in London. Analysis: Smith briefly exited Sunday's game with a shoulder injury, but that didn't prevent him from leading the Jaguars in tackles. At the midpoint of the season the 27-year-old has 65 tackles (49 solo) and a sack, putting him on pace for more than 100 tackles, which he has achieved in each of his first four seasons in the league. Jacksonville enters their much-needed Week 9 bye on a four-game losing streak. Smith (shoulder) returned to Sunday's game versus the Jaguars, Daniel Popper of The Athletic reports. Analysis: Smith didn't miss much time while recovering from a shoulder injury that required assistance to get him off the field. The fifth-year pro is a centerpiece of the Jaguars' defense with 57 tackles and one sack in the first seven games. Smith is questionable to return to Sunday's game against the Eagles due to a shoulder injury, Tad Dickman reports. 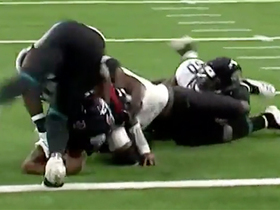 Analysis: An integral part of the middle of the Jags defense, Smith needed assistance to get the sideline, where the nature of the injury was honed in on. Entering Week 8 with 57 tackles (tied for 11th in the NFL), he'll leave London with just three more if he's unable to reenter the game. Smith had 10 tackles (six solo) in Sunday's 40-7 loss to the Cowboys. 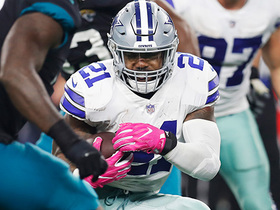 Analysis: The Jaguars gave up 206 yards rushing to Ezekiel Elliott and the Cowboys, providing plenty of opportunities for Smith in the middle of the defense. The 27-year-old leads the team with 49 tackles (36 solo) and a sack through the first six games of the season. Smith recorded 13 tackles (eight solo) in Sunday's loss to Kansas City. Analysis: Smith's 13 tackles were his best of the season by a sizable margin. He's racked up 39 tackles through five weeks, putting him on pace with his previous seasons' average of 115 tackles. He and the Jaguars will look to bounce back with a win against the Cowboys in Week 6. Smith posted eight tackles (all solo), including a sack in Sunday's loss to Tennessee. Analysis: Despite the loss, Smith and the Jaguars' defense played well Sunday, holding the Titans to just nine points. Smith has never been prolific with sack numbers, recording just one sack per year the last two seasons. Getting the first sack of the year in Week 3 could be a sign he'll improve upon past performances in 2018. Smith had eight tackles (seven solo) in Sunday's 31-20 win over the Patriots. Analysis: Smith played all 61 defensive snaps as the Jaguars held Tom Brady and the Patriots to 302 yards of offense. The 27-year-old now has 15 tackles (12 solo) through two weeks and has a good matchup against the run-heavy Titans in Week 3. Smith (back) was a full participant in Friday's practice and will play Sunday against the Patriots. Analysis: Smith was a workhorse in Week 1, logging 71 defensive snaps and making seven tackles. He'll be tasked with slowing down a banged-up Patriots backfield, featuring Rex Burkhead (concussion), James White and Sony Michel (knee). Smith is dealing with back injury and was a limited participant at Thursday's practice. Analysis: The severity of the injury remains unclear, but it has prevented Smith from practicing fully so far this week. The 27-year-old's status for Week 2 will remain as questionable unless he is able to return as a full participant Friday. Smith finished Week 1 Sunday against the Giants with seven tackles (five solo). Analysis: Sunday's effort was a solid start for Smith, who has reached triple-digit tackles every year he's been in the league. 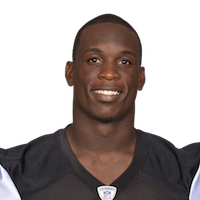 He remains a viable IDP option at outside linebacker for a Jaguars defense that ranks among the best in the league and could have his work cut out for him next week against the Patriots and Tom Brady, who loves to utilize his tight ends and running backs in the passing game. Smith (ankle) was removed from the injury report ahead of Sunday's game against the Steelers. Analysis: After missing Wednesday's practice with an unspecified ankle injury, Smith progressed to full-participant status by week's end and appears set to take on his usual workload Sunday. Smith (ankle) returned to practice in a limited capacity Thursday. Analysis: Smith seemingly injured his ankle in Sunday's wild-card victory over Buffalo and wasn't available to practice Wednesday. While it isn't clear if his status is legitimately in question for Sunday's tilt with Pittsburgh, Smith's level of participation in Friday's session should help clarify things. The Jaguars are expected to hold Smith out of practice Wednesday due to an ankle injury, Ryan O'Halloran of The Florida Times-Union reports. Smith has been cleared from the league's concussion protocol, John Oehser of the Jaguars' official website reports. Analysis: Smith missed the last two games due to his head injury, but in addition to his protocol clearance, he was not listed on the Jaguars' prepractice injury report Wednesday, which puts him on track to return to action this week. Smith (concussion) is listed as inactive for Sunday's game against the Seahawks. Analysis: Smith will miss his second consecutive game, and the Jags will be without their three-time, triple-digit tacklers. With 83 tackles (63 solo) through 11 games, Smith is still within reach of posting over 100 tackles once he gets healthy. For now, Blair Brown and Paul Posluszny will log additional defensive snaps in Smith's absence. Smith (concussion), who is listed as questionable for Sunday's game against the Seahawks, is considered unlikely to play, Ian Rapoport of NFL Network reports. Smith (concussion) is questionable for Sunday's game against the Seahawks, John Oehser of the Jaguars' official site reports. Analysis: Smith was a full practice participant Wednesday and Thursday, but the Jags will list him as questionable in case there's any setback with his concussion symptoms. He's on track to clear the protocol and return from a one-game absence, likely pushing Paul Posluszny (groin) back to a part-time role. Smith is averaging 7.5 tackles per game and already has a career-high three interceptions. Smith (concussion) was a full practice participant Wednesday, Mike Kaye of FirstCoastNews.com reports. Analysis: Smith's return to a full practice is the penultimate step in clearing the concussion protocol, putting him on track to gain final clearance from an independent neurologist prior to Sunday's game against the Seahawks. 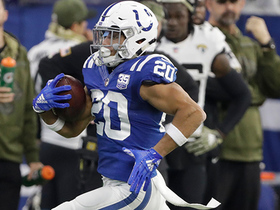 He was held out of Sunday's 30-10 win over the Colts, allowing Paul Posluszny to handle a three-down role while Blair Brown picked up a few snaps in the base defense. Coming off a 14-tackle, 1.5-sack performance, Posluszny will be an elite IDP play if Smith misses another game. Smith is still in concussion protocol, Mike Kaye of FirstCoastNews.com reports. Analysis: Smith was ruled out for Sunday's game against the Colts due to the concussion, and it looks like he'll remain in protocol for most of this week as well. Expect another update on Smith's progress to come once the Jaguars release their official injury report, but Smith is at risk of missing a second straight game. Smith (concussion) has been ruled out for Sunday's game against the Colts, Ryan O'Halloran of The Florida Times-Union reports. Analysis: Smith didn't practice this week, so he still has a few phases of the concussion protocol to complete before being cleared for game action. 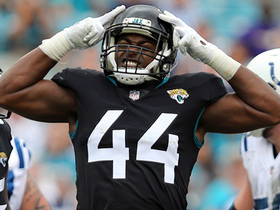 The linebacker has 83 tackles (63 solo), one sack, five pass breakups and three interceptions so far this season, which could leave a gaping hole in the Jacksonville defense. Blair Brown is expected to act as Smith's primary replacement on the weak side. Smith (concussion) isn't expected to take part in practice Wednesday, Michael DiRocco of ESPN.com reports. Smith was forced out of Sunday's game against the Cardinals with a concussion. Analysis: Prior to his exit from the contest, Smith had recorded seven total tackles. He'll now look to gain medical clearance to play in advance of next Sunday's game against the Colts. Smith had an interception and recovered a fumble for a touchdown in Sunday's victory over Cleveland. Analysis: Smith had only five tackles (three solo), but more than made up for it with the takeaways. It's the 26-year-old second touchdown of the season and he remains just outside the top-10 in tackles with 76 (57 solo). 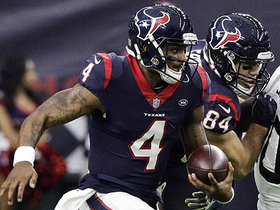 Houston Texans quarterback Deshaun Watson evades defenders for 15-yard gain. 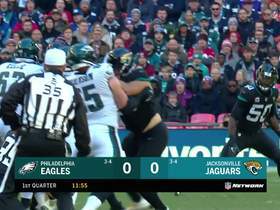 Jacksonville Jaguars defensive tackle Marcell Dareus forces Philadelphia Eagles quarterback Carson Wentz to fumble the ball. Dallas Cowboys running back Ezekiel Elliott zips through an open gap for a 21-yard gain against the Jacksonville Jaguars. Dallas Cowboys quarterback Dak Prescott catches his own bounced fumble for a first down against the Jacksonville Jaguars for Week 6.